Do you live in a south facing home? Maybe you live in a flat that is flooded with sun in the summer? Do you have a conservatory that you just need to keep cool? All of these options mean that you could benefit from vertical blinds, which will keep the sun out and the temperature down when you need to keep your space cool. The idea of having sun in your home all the time sounds wonderful, but in reality, it just isn’t an option. You need to be comfortable, and avoiding the glare of the sun is important. It will be much more enjoyable this way. Vertical blinds offer a sophisticated option for shading your property, shop front or other type of building. You can draw them down over your window when you want to, so the shading option isn’t permanent. This allows you to choose when you want some shade, and when you want the sun to come flooding back in. It’s a highly versatile way of enjoying your property. Blinds give you the option of picking and choosing depending on your mood, the position of the sun and whether you want some privacy. So what are vertical blinds, and how do they work? Vertical blinds are fitted onto the outside of your property. They can cover the windows and doors on the outside as needed, giving you shade, privacy and a better living environment. They are usually electrically operated. It is easy for you to operate your blinds with a remote control as they are electrically operated, making it simple to draw them across the whole of the window, door or balcony. They will be made from a strong and robust material. Window blinds are made to last, withstanding harsh weather and very much lasting you into the future. They should be considered a good investment. They can be used as, or in conjunction with, an awning. You can get different blind shapes and designs if you want some light to come in at the bottom, creating more of an awning-like shape. If you want to use the blinds with an awning or shelter of some description, you can – you just need to make sure you specify exactly what you need when ordering. This is a popular option for shops and other commercial premises as opposed to homes. Blinds can also offer you protection from the weather. If you choose a zip design, this can offer you shelter from wind and rain. You might use this kind of design for a balcony. Remember that no two blinds are the same; every home or business will require a slightly different, tailored solution. Think about what you need to get from a blind, like privacy, or shade at certain times of the day, and talk this over with a window or door blind specialist. They can ensure you find the perfect blinds for your house, shop, flat, holiday home, conservatory, or anywhere else that could benefit from a professional vertical blind fitting. A log cabin can make the perfect space for a home office, giving you a room away from the rest of the house that will allow you to have some peace whilst completing your work. If you find that you get distracted by what is going on in your house, then having a separate office can be a great idea. In fact, it doesn’t need to be a log cabin, necessarily – the main thing is that you can have an office away from distractions in a peaceful, quiet space. If you have a cabin for your office, then you can personalise it and design it however you want. This is one of the best aspects of having your own office; the customisation stage. Choose a design scheme that works for you, and select furniture that will be both practical and comfortable for your work patterns. Make sure this space is somewhere you can really get your head down. Creating a home office from scratch require planning, vision and a lot of work, but it is made much easier if you have a good fit out contractor on your side. This is important if your home office is going to be your primary place of work, and you need it to be professional. Perhaps you will see clients there, and at the very least, it needs to be a productive working environment. Find a fit out contractor who is used to working with smaller spaces and will personalise your space to meet your needs. Many can also offer space planning and design services, meaning they can do everything you need. You won’t need to go to architects and obtain plans first; your fit out contractor will work with you to achieve your perfect office. They will analyse your space to help you fit in as much as you can. Office furniture doesn’t have to be boring and sterile. You can make your office furniture as fun and as attractive as you like, and what better way to do so than by painting it yourself? You will save yourself a lot of money by upcycling furniture and if you decide you want to make some changes to the furniture itself, then you can also sand parts down and change its shape. For example, if you decide that you would like to make the drawers on your desk fit into it better, then you can do this with a little DIY. You should always make sure you have a smooth surface to paint, so if your furniture is rough around the edges, sand it down first. Use tape to mark out the edges, making sure you don’t paint over the lines. Your office will have a new lease of life when you have finished. The office space you design can have a bearing on the performance of your staff within the building. An office is more than just a room; it is a place where people can spend the majority of their time during the week and it needs to inspire. Make sure you take staff into consideration when you are designing an office space. On the most basic level, make sure you staff can carry out their jobs safely within their office environment. This means ensuring the layout works in terms of health and safety, making sure there is enough storage to avoid trip hazards and giving your staff plenty of work space. It’s also important you make sure your staff can work happily in your building. Think about different ways of working and create zones, for example, put together an open plan work space with sofas and whiteboards for brainstorming sessions. Make sure the building is generally and enjoyable and comfortable place to be, for work time and leisure time. 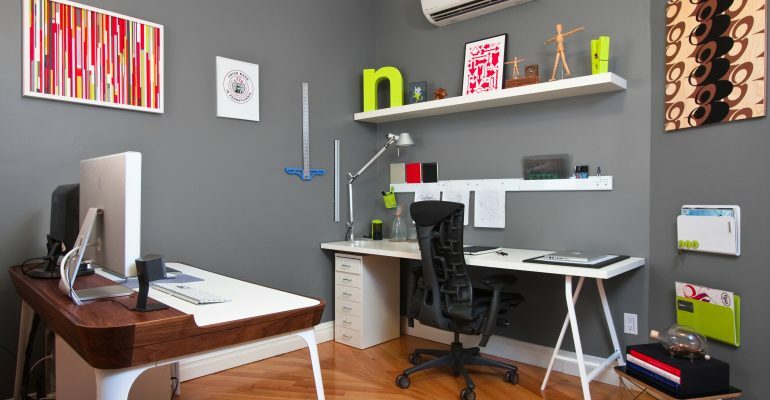 When you’re thinking about updating your home office it’s hard to know where to start. It’s sometimes difficult to decide the style, the furniture or even if you are looking for home office or garden office. But before you start buying, have a think about what you really want to do with your office? Needs to reflect your personality, and your ideas through the design, the colours and the style. Tell us your ideas, suggestions and share your projects with us!